In the last 10 years, the R statistics language has exploded in popularity and functionality - emerging as the analytical tool of choice. Used by more than two million analysts around the world, R has become the standard of innovation in statistical analysis. 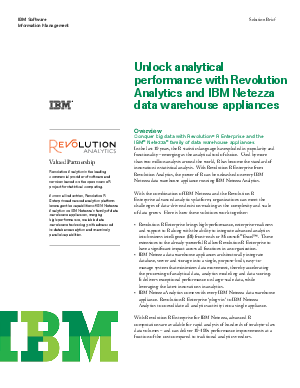 With Revolution R Enterprise from Revolution Analytics, the power of R can be unleashed on every IBM Netezza data warehouse appliance running IBM Netezza Analytics. With the combination of IBM Netezza and the Revolution R Enterprise advanced analytics platform, organizations can meet the challenges of data-driven decision-making as the complexity and scale of data grows. Across all industries, Revolution R Enterprise advanced analytics platform leverages the capabilities of IBM Netezza Analytics on IBM Netezza's family of data warehouse appliances, merging high-performance, scalable data warehouse technology with advanced in-database analytics and massively parallel capabilities.